As hard as it is to imagine when you look out your window these days and see all that snow, summer is coming up fast and like many parents, I’m wondering what will the kids do this summer. We don’t have a First Tee Program in Vancouver yet (although there is a proposal on the table), but even if there was a chapter, our two kids are into so many things, I don’t think they’d be as interested in a camp dedicated to the game I love so much – heartbreaking for me, but kids gotta do what kids gotta do. Anyway…the question is, what do kids who have multiple interests do for the summer? Well there are a lot of summer camps for kids, but unfortunately many of them are too expensive for many families, and it’s only getting worse with this recession we find ourselves in. The good news is that there are some great programs out there for kids who normally wouldn’t be able to afford camp. One that came to my attention recently gives inner-city children in New York the joy of a summer vacation with volunteer host families and at Fund camps. 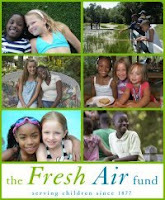 It’s called the Fresh Air Fund and it’s been helping underprivileged kids since 1877. Wow…that’s a long time! Fresh Air Fund hires staff members with a wide range of experience in some pretty amazing fields, including: environmental science, culinary arts, fashion design, orienteering, leadership, video editing, digital and dark room photography, ropes course, nutrition and agriculture. I know Fresh Air Fund is actively recruiting new counsellors now for this summer. If you are over 18 and have completed at least one year of college by this summer, they want to hear from you. It looks like a great summer job. What I would love to see is some college students with golf experience apply. Maybe if Fresh Air had golf talent on staff, they would find some innovative ways to offer lessons to their campers. What if they collaborated with Fresh Air Fund and made golf a possibility for kids who would probably never have a chance to play this fantastic game? It’s probably not feasible this year, given the timing, but maybe next year? Hmmm….something to think about. Anyway, if you know of a college student who loves working with kids and is looking for a rewarding summer job in the NY area, pass along this link so they can apply before the June deadline.